At HLFPPT, we are passionate about ensuring safe motherhood and better child health, ultimately building happier and healthy future generations. Hindustan Latex Family Planning Promotion Trust (HLFPPT) is a national not-for-profit health services organisation, working on the entire spectrum of RMNCH+A (Reproductive, Maternal, Newborn, Child & Adolescent Healthcare), HIV Prevention & Control and Primary Healthcare. HLFPPT is promoted by HLL Lifecare Ltd (a Mini Ratna PSU under the Ministry of Health & Family Welfare, GoI). It was founded in 1992 and is registered under the Travancore-Cochin Literary, Scientific and Charitable Societies Registration Act, 1955. For the last 25 years, we have been serving communities across India with health solutions and contributing towards Health System Strengthening through direct programme implementations, technical assistance and capacity building. 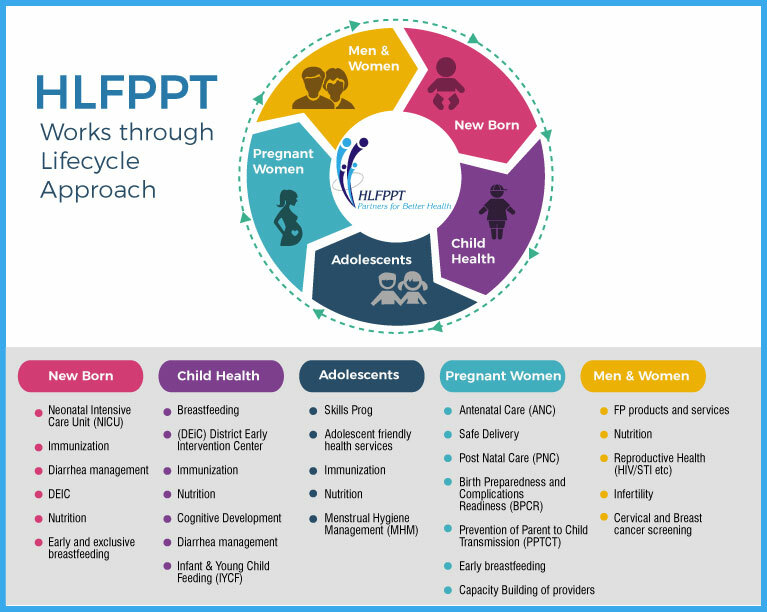 Today, HLFPPT has emerged as India’s leading organisation in Reproductive & Child Healthcare and a pioneer in promoting public health through Social Marketing & Social Franchising strategies. We work through ‘Lifecycle Approach’, offering healthcare through all stages of life, with a keen focus on bringing every individual under the continuum of care HLFPPT actively contributes towards the goals of the National Health Mission, NACP, FP 2020, UHC, MDGs and now, SDGs. Owing to our diverse technical experience and proven track record of impact-driven and scalable interventions, HLFPPT is a chosen collaborator for designing, implementation and evaluation of programmes for the Government, several National & Global Development Agencies as well as top PSEs and corporate for CSR, including Fortune India 500 Companies. We have been promoting Primary Healthcare to underserved communities and remote regions though several CSR Partnerships. We have a dedicated team of experienced professionals in the fields of Social Marketing, Social Franchising, Capacity Building, Community Development, Public Health, Programme Management, Branding and Product Development, Research, Behavior Change Communication, Monitoring & Evaluation, Hospital Management and Skill Development in the Health Sector.